My Little Bookcase: TOO BUSY TO READ????? Isn't life crazy? Everyone around me seems so busy: working parents, stay-at-home mums, even friends without children. We're all busy, busy, busy. Finding somewhere cosy to snuggle up with your child to enjoy a book together sounds perfect but, for some of us, finding time to read with our children is almost impossible once we get through the daily chores. There are moments in the day that you make time for because you don't have a choice, such as feeding your children, bathing them and doing the supermarket shopping. Try making these daily tasks more enjoyable by using them as an opportunity to to read with your child. Over the next four days, I will share with you some reading opportunities you may never have thought about. You've taken the time to prepare lunch for your little munchkin. Why not join them at the table with a special book? Read to them while they munch away on their little sandwiches. A board book exploring delicious foods and bright colours. Read about the dinosaur's daily diet in a lift-the-flap book full of colour, description and rhyme. 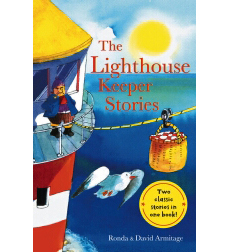 Read two classic stories, 'The Lighthouse Keeper's Lunch' and 'The Lighthouse Keeper's Picnic', in one book. Two stories about feeling hungry and being greedy. A funny, action-packed story about dinner and cutlery on the run.